an invitational exhibition of printworks created by students in Colorado and bookworks created by students throughout the United States. This exhibition, curated by gallery director Alicia Bailey, showcases printmaking students from Colorado College in Colorado Springs (Brynn MacLeod and Natasha Blitz), Colorado Institute of Art (Elena Zadouri, Ronnie B. Johnson and Tai Bickham) and Metropolitan State College of Denver (Haylee Ebersole and Tymla Welch). The exhibition includes examples of a wide range of imagery and technique. In addition to single process techniques such as Haylee Ebersole’s intaglio & lithograph prints, Natasha Blitz’s photopolymer prints, Brynn MacLeod’s woodcuts and Tai Bickham’s salt prints, the exhibition includes mixed-technique prints such as Tymla Welch’s mixed-process intaglio, screen-printing and flocking prints, Ronnie B. Johnson’s platinum/palladium prints that are crafted by combining both film and digital negatives and Elena Zadouri’s cyanotype dresses. There are very few institutions that offer degrees in bookarts degrees in the United States. This exhibition includes representative works from those that do such as the University of the Arts in Philadelphia, PA (Andrew Huot and Asa Yoshi) and Columbia College Chicago, IL (Areujana Sim). Most of the students in the exhibition are in programs that offer occasional book arts classes in the printmaking, graphic arts or writing programs. Hannah Penny Nichols and Agnieszka Michalska, are both in the Masters of Creative Writing Program at the University of Colorado, Boulder, Anita Redmond is working towards a BFA in painting at Northern Kentucky University in Highland Heights, Beth Lee is pursuing a Bachelor’s Degree of Fine Art in Graphic Design at Florida State University in Tallahassee, Lindsey Yankey is working towards a BFA in Illustration at the University of Kansas in Lawrence, Ginger Burrell is pursuing a BFA in Photography at San Jose State University, San Jose, CA. The following students are all in different disciplines at Metropolitan State College of Denver, CO: Jacintha Clark (painting), Matt Nelson (sculpture) and Cassandra Stampadoes (metelsmithing). Included in the Student Works show at Abecedarian Gallery are seven Platinum/Palladium prints by Ronnie Johnson, a BFA candidate at Denver’s Art Institute of Colorado. Johnson’s love is working with film but he understands and implements well the qualities of working digitally. The end result are prints with tonal subtleties that suit both subject matter (natural and urban landscapes) and technique well. Framed prints are $450 each. Unframed $350 each. Statement: My two portfolios, Landscapes and Cityscapes, are a study in contrasts. Though they are opposite subject matter, I am producing images about the same thing: light and darkness, stillness and motion, time and space. I study how these contrasts exist in the wilderness and in the urban environment. When the moment is right, they can overwhelm the viewer with beauty and emotion, and that is the moment I intend to capture with my images. I use a hybrid workflow by capturing my images with 4×5 black and white film as well as a high-end digital camera. I scan my negatives to produce a digital negative. This gives me a consistent negative to produce my images, as well as the ability to print various sizes, and use images created with a digital camera. The platinum process has been in use since the 1870’s and has been used by such photographers as Alfred Stieglitz, Edward Steichen, and Edward Weston among many others. Platinum prints are prized for the extended tonal range and archival abilities, both of which are unmatched by any other photographic printing process. The image will last as long as the paper lasts, without fading or degradation. Tai Bickham is also pursuing a degree at AIC, an associates degree in photography. She has also been interning at Abecedarian Gallery since spring 2007. Two kallitypes by Tai are on exhibit in this show. They are not for sale. I use photography as a means of expressing my perception of my environment around me, and give an introduction to who I am and what captivates me. My photographs represent thoughts, emotions and feelings that at times cannot be formulated or crowded with words. Often, it is through my lonesome adventures that a better understanding of what I find inspirational or beautiful comes through with my pictures and gives light to qualities of my character that may be unknown by others. Often, what draws me to certain subjects is light, the emptiness of space, or just an internal pull towards certain landscapes or subjects that evoke a reaction in thought and emotion from me. Within the past year, I had the opportunity to learn more in the development of alternative processes for photography. In my brief introduction to various processes like cyanotypes and van dykes, I really enjoyed the color variance and toning that Kallitypes could give to an image. The images were toned with gold for archival purposes and to provided a cooler tone of blue and deep browns from the reddish brown’s that tend to come forth with this process. Water goddess and Tranquility, were two of the multiple images I captured digitally and then turned into digital negatives to take into the darkroom and develop on watercolor paper with the printing out process of the Kallitype. Haylee Ebersole is pursuing a BFA degree with an emphasis in printmaking from Metropolitan State College in Denver. Her mixed media pieces introduce an interactive element which is well suited to Abecedarian Gallery’s emphasis on book arts. My work comments on the concept of traces and how abandoned pictures and objects can provide documentation of the people who once possessed them. Using found photos, I provide these traces of people with meaning, which is otherwise lost as a result of their (the pictures) abandonment. Functioning as make-shift archives, my work conveys ideas about family, traces of people, and constructs of memory. Tymla Welch is also working at MSCD. Most of her individual works incorporate a wide range of media giving them a wonderful surface appeal. My work is about juxtaposition, taking elements out of context and placing them together, with an underlying sense of humor. The interpretation of each piece is open to the viewer, creating a question of what is being portrayed. 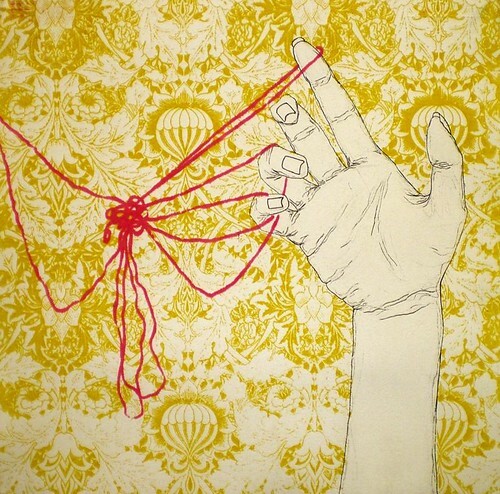 The combination of various printmaking techniques further supports this juxtaposition, conceptually and visually. Brynn MacLeod is an art student at Colorado College in Colorado Springs. In the StudentWorks exhibition she has 5 framed woodcuts, print size 15×20 from a series called Self Abstraction. Also on display is one photopolymer/chine colle print – Thought Process 1. Natasha Blitz is also a student at Colorado College in Colorado Springs. Here she exhibits 5 mixed media intaglio prints. They are $200-$250 framed. Since starting college, I have spent nearly a year studying abroad. These experiences have made me increasingly more aware of the importance of staying present. I feel caught in a struggle to hold on to the transient experience of travel. I too often approach new places with my camera in front of my eyes, snapping photographs in an effort to hold on to what I have seen, instead of enjoying where I am. I hope to avoid being this type of tourist, both when traveling and in my day-to-day life by making my experience of my environment personal to me. This group of prints was created with drawings and photos made last summer while living in Bologna, Italy. I used drawing as a way of becoming personally involved with my new city. The prints, created upon my return, reflect on the transformation of a place through the process of memory. The separate elements of each image were layered in Photoshop and with multiple polymer plates to evoke the multidimensional nature of memory. The drawing element is more prominent than the photographic to express that the greatest detail of my experience is retained where I took the time to draw. MSCD does not have a book arts program but each fall semester MSCD students can study book arts under the tutelage of Barbara Hale. Three students from fall 2008 class are included in this exhibit. Cassandra Stampadoes’ primary focus is in jewelry and metalsmithing. 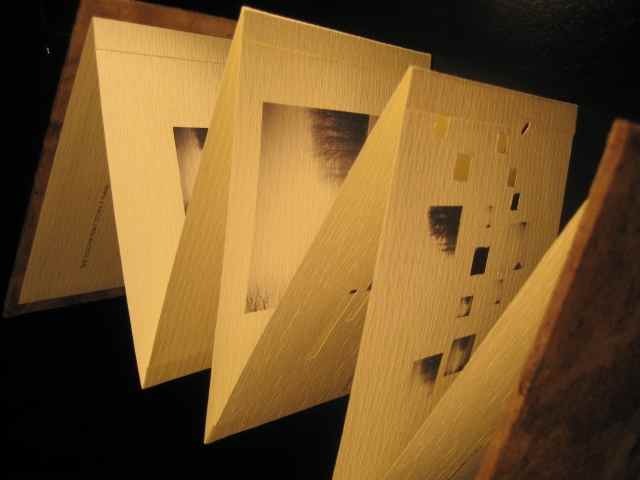 Two of her bookworks are included in this exhibiton. The ring is fabricated out of Sterling silver, Copper and Brass. Statement: This it my first attempt at utilizing the book form as an outlet for my creativity. I have an interest in the artist’s book as a container of content but also as a way of pushing the boundaries of art. I enjoy the complexity that working with books offers, and the relationship I can create between the reader and the book. Andrew and Asa are both in the MFA program at the University of the Arts in Philadelphia, one of the very few MFA programs that offers an emphasis in Book Arts. Asa Yoshie sent three beautifully crafted and well conceptualized books for this exhibition. As a visual artist, I desire to transform intangible things, such as feeling, memory, imagination and experience, into the tangible. I hope to leave the traces of these intangibles as objects and convey a new experience to the viewer. Providing a sense of communication is an important aspect in my work. I am attracted to the book form because it is a container of knowledge, a teller of stories and an object for contemplation. The book form requires a viewer to physically handle the object in order to experience it as a whole. I consider that touching the actual object is a highly autonomous interaction. Once in a reader’s hand, a book provides its viewer a private, solitary and quiet encounter with thoughts hidden inside. Layers of meanings unfold as the reader goes through the pages. I am fascinated by the way that the book as a medium of communication also encompasses the process of communication itself. My experience of dealing with the different languages has been intense and interesting since I came to the United States from Japan in 2001. I have become curious in observing how people perceive the unfamiliarity in sound and image, and how they compromise their feelings of uneasiness when encountering such strangeness. My House/Your House is a re-examination of our perception of matters of “differences.” In this book, I focus on the sound and the image conveyed by the different forms of language. I aim to construct the place of wonder and a bit of confusion, while also conveying the sense of fluidity in language. I want to investigate and be open to the complexity of communication. Andrew Huot has 4 pieces in the Student Works exhibition, ranging in price from $25-$45. My art is about my observations of the world’s small, passed-over details. Looking at everyday situations, I distill them down to their essence and then extend those situations outward to our collective experience. I want to make the viewer laugh or pause to consider the unnoticed details of the world. My goal is to make well-crafted artist books and prints that tell a story in a graphic and oblique way. My process starts with observing life around me; gathering details, making lists, drawing diagrams, and maps. I find the lines and shapes of patterns that I then use to begin the process of developing a complete experience, a path for the viewer to navigate. I work in traditional bookbinding structures and use methods of reproduction such as woodblock and letterpress printing for the tactile qualities they give to the final artwork. The history and form of the book appeals to me and I find ways to play with that history. Themes running through my work include commentary on everyday life and the unobserved humor of the day-to-day. The work I am doing now reflects my own experiences and life, from daily dog walks, trips to visit relatives, to interaction with my family. I observe my environment and pay attention to what I might miss while I am busily going about my day. Two the students exhibiting books are in writing programs rather than visual art programs. Agnieszka Michalska is pursuing an MFA in Creative Writing at University of Colorado, Boulder. As a fine art photography and creative writer, I constantly look for engaging ways to integrate text and image. Overall, it’s the tension in the space between them that motivates my fragmented understanding of both. As forms of representation, both text and image are limited within their own reality. I aim to push those limitations. The artist book is one outlet for a life-long obsession. Hannah Penny Nichols is also pursuing an MFA in Creative Writing at University of Colorado, Boulder. Arejuana Sim is a first semester of Columbia College Chicago in MFA Book & Paper. The 3 books she has in this exhibition are beautifully crafted examples of form supporting content. Beth Lee is pursuing a BFA in Graphic Design at Florida State University. Her two books in this exhibition make clear her self-proclaimed love of words. thoughts and allows them to be turned over and examined, tasted and built upon. the words’ texture and color with their meanings. Ginger Burrell is a student at San Jose State University. The 3 books mixed-media pieces she has in this exhibition are craftily realized explorations of sculptural construct dictating content. Her piece Love/Chocolate presents in a heart shaped candy box the connection between love, chocolate and romance in a whimsical way. ($350). Tree is a bi-directional piece crafted from a small tree stump ($350 ). Pockets is another example of using the material (jeans pockets) to refer to itself and presenting a time capsule of what people are carrying in their pockets right now ($250). Anita Redmond has 2 mixed media books in this exhibition. She is an art student at Northern Kentucky University. As a book artist and a painter, I am inspired by the mysteries of imagery and words. I feel you can’t have one without the other. The interesting play on words with imagery is very important to me, as it keeps the interest of the reader along with my own. When making books I ask the question, what imagery comes to mind when reading the text and how can I make it unique? My idea of a “book” is always changing and my books are always a surprise to me. I try to choose unusual materials for my book making, such as coconut husk and yarn. I find that when I think of out of the ordinary techniques and materials, the more exciting the project becomes. Exploring materials such as yarn gives me a better understating of how I can weave actual words together.